“I don’t see nothing wrong with a little bump n’ grind.” – R. Kelly. This line will make sense later. 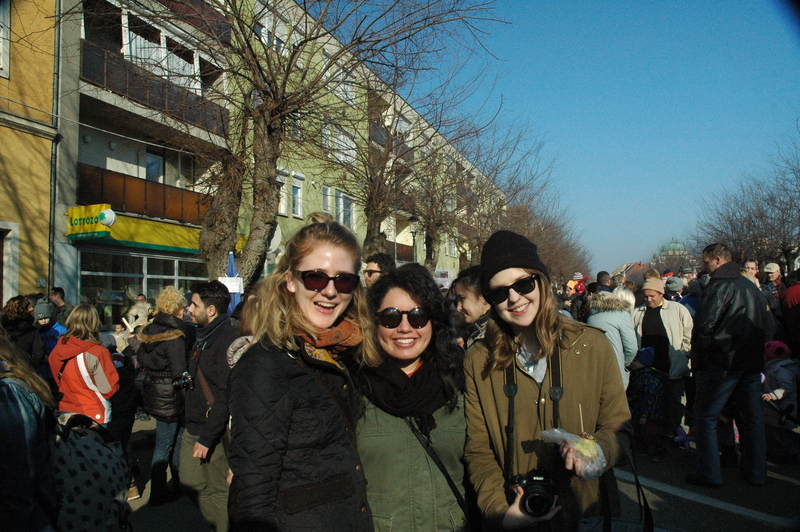 On Sunday I organized a field trip to Mohács for Busójárás, a celebration held at the end of the Carnival (Farsang) season here in Hungary. Matt, Kendahl, Dani, Carlyn, and my coworker Dani bácsi accompanied me and 21 of my 7th and 8th graders to a festival where these masked, wooly-cloak-wearing men lurk about town. 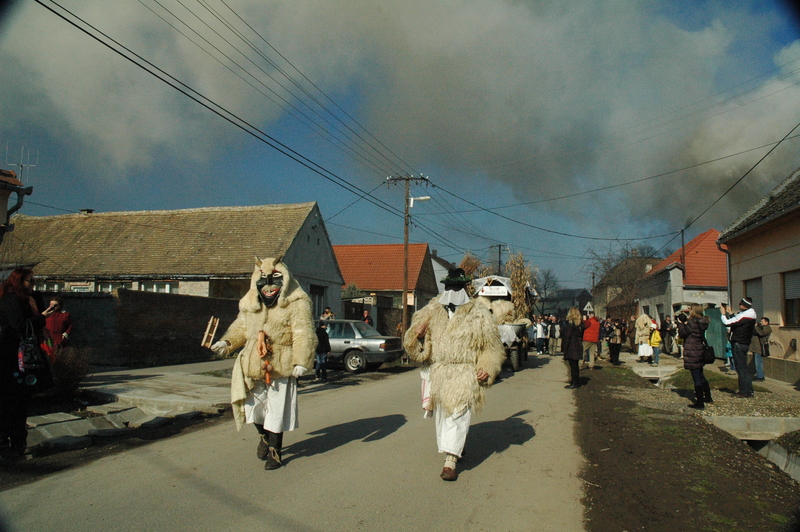 Busójárás celebrates the scaring away of two things: winter and the Turks. In 1687 a Croatian minority defeated the Ottoman army during the Second Battle of Mohács. The first battle, which took place in 1526, ended in a victory for the Ottoman Empire. 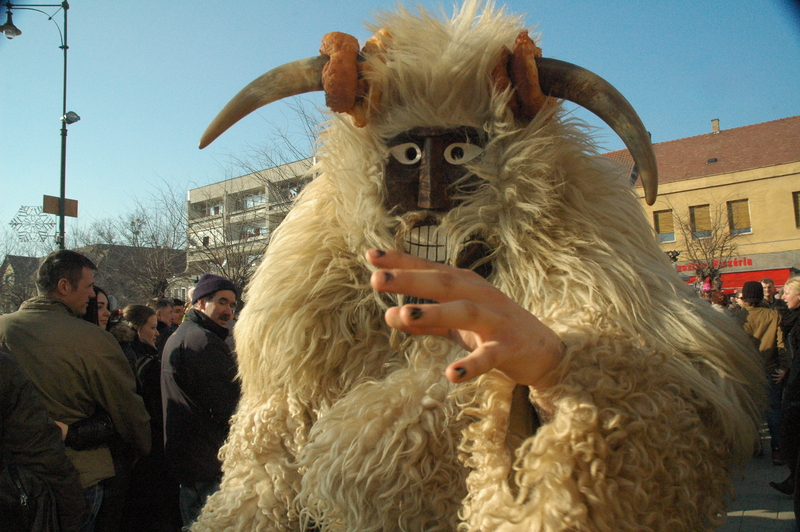 Legend has it that the Croats donned scary wooden masks to frighten away their oppressors. This festival is even on UNESCO’s Intangible Cultural Heritage of Humanity list. Although this celebration has historical roots, some lewd features have surfaced. Some Busós find joy in grabbing women and making the cowbells tied around their waists ring faster. Phallic symbols are also paraded about – great place for a field trip, I know. R. Kelly! R. Kelly I tell you! 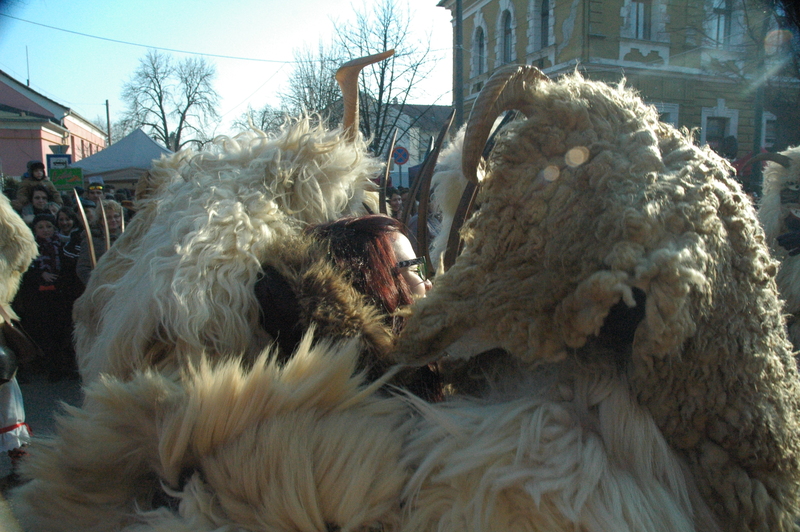 I attended this festival two years ago, but did not have enough money to buy a Busó mask. Out of everything that Hungary has to offer, the souvenir I want the most is one of these hand carved masks. Mask makers pass on their knowledge from generation to generation. Unfortunately my Balkan trip has become more of a priority when it comes to money (that and a few expensive medical bills), so I will end up leaving Hungary without a mask. If I ever settle down [insert scoff here] I will have one gracing my home at all times. 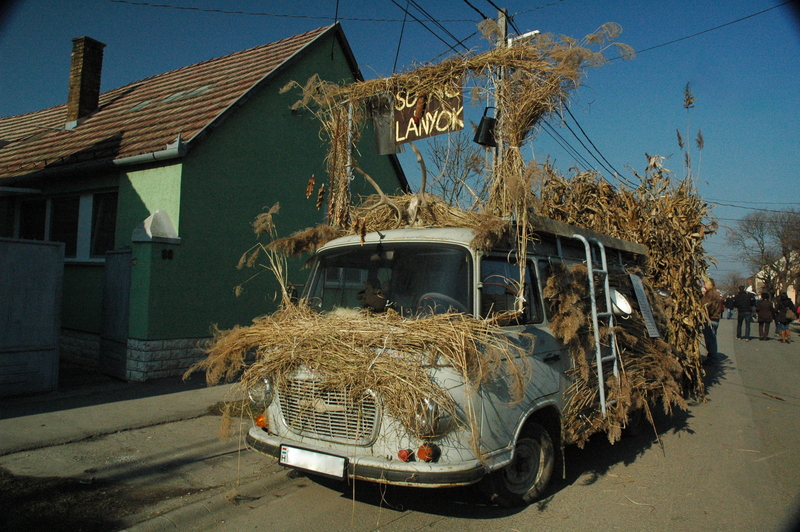 Yes, this Busó touched me. Most of my students have not been to Busójárás before (correction from my last post: two have been – that’s for you, Kata). As a foreigner, I find most Hungarian aspects of life to be fascinating, thus causing me to run around the country trying to absorb as much as possible. Many Hungarians find it either strange or awe-inspiring how many places I have been. I do not feel as if thirty or so different villages/towns/cities is that much, but apparently it is to some people. The festival this year was packed. If you have more than two children, I applaud you. I was constantly counting children. Each and every time I questioned my ability to count to 27 and would start over. When we first arrived to Mohács, we b-lined it to a slew of porta-potties. 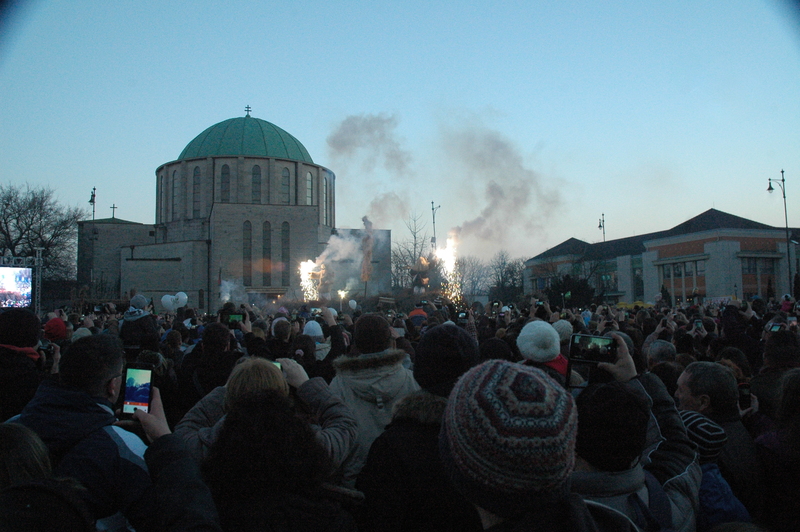 Then we followed a mass of people down a street to where we thought would be the main square – hint: we were wrong. I had hoped to see the Busós cross the Danube, but that clearly did not happen. My mass of hangry students, friends, and I finally made it to the main area, where we inhaled foods like kürtőskalács (chimney cake) and lángos. Two students and I split a gargantuan sausage and a greasy plate of French fries. After finishing food, we split up into two groups: Dani bácsi, Matt, and Kendahl took my 7th graders and Carlyn, Dani, and I took my 8th graders. Due to our huge detour, only Dani bácsi knew how to get back to the place where the bus was to pick us back up. I thought that we would just easily convene again after the parade – hint: I was wrong. The sheer amount of people attending the festival was overwhelming. During the parade my students and I had to peek through tiny holes between people to catch brief glimpses of the Busós. After watching for a while, some my students decided to sit off to the side for a bit. Dani, Carlyn, and I sat on the “cold” ground, to which we received shocked and appalled stares from passersby. In Hungary it is a common belief that people (namely women) can catch colds by sitting on cold surfaces. It was here that we realized that our calls could not go through to the other group. Awesome! After sitting in our spot off to the side for a bit, we decided to go to a fountain near the main square. It was on steps, so we hoped that the other group would be able to spot us more easily if we hunkered down there. I tried to contact the other group for the better part of two hours. I repeat: two hours. In order to entertain some of my students, I loaned them my DLSR. I now have about 200 pictures of attractive men, a random baby, and hilarious candids of my students. To all those planning on going on a field trip here, do not split up. One of my calls finally went through, to which we all celebrated like I did when Spain won the World Cup in 2010. After watching the burning of the effigy, we went home. Hopefully my students enjoyed themselves and aren’t just telling me they did to save face. I only want the best for them. Thank you Matt, Kendahl, Dani, Carlyn, and Dani bácsi for helping me out on Sunday! 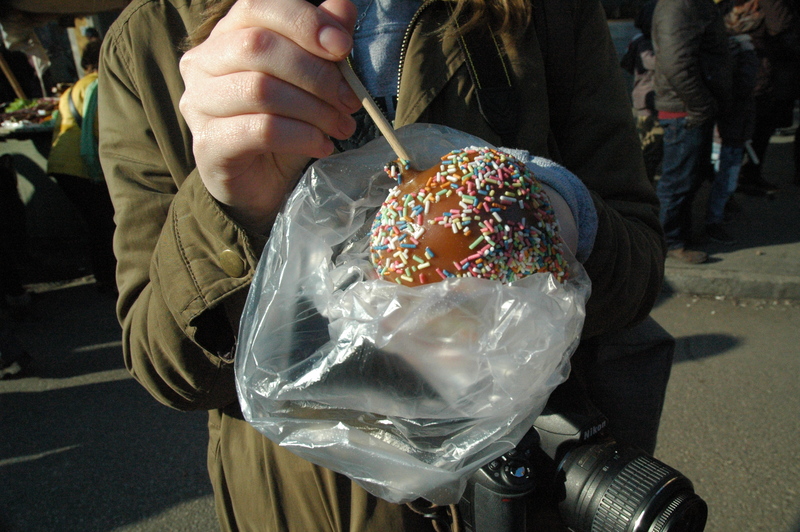 A Lesson From Miss Jennifer: Consider bringing long-range walkie-talkies to huge events.